tl;dr: HackADay is a passionate community of hackers doing awesome stuff. It deserves more attention than I can give it right now, as I’m ultra-focused on the launch of Inside.com. So, we’re looking for a caring new owner with a stellar track record of not f@#$ing up brands to take it over. We created HackADay back in 2004 because one of Engadget’s awesome bloggers, Phil Torrone, wanted to do super-geeky projects every day and the Engadget audience wasn’t exactly into that frequency. When we sold Weblogs Inc. to AOL, we took HackADay out of the deal because it was doing stuff that a corporate parent’s legal arm might not feel comfortable with (e.g., hacking cable boxes!). So, I bought it and kept it safe and warm inside of Mahalo.com for the past couple of years. However, since I’m super focused on the Inside.com launch, I need to find a new home for it. It’s doing over $14k a month in advertising without a sales force (just AdSense mainly), and it’s got an amazing stable of bloggers. Given its 6m pageviews a month and with an advertising sales force doing a modest $15 RPM, Hackaday could do $90k a month. We’ve got 5,674 members of our email list after just five months (should have started it 10 years ago, would have been at 100k+ by now!). Our Twitter handle has 29k followers. We’re hoping someone like Maker, DemandMedia, InternetBrands, AOL (without Time Warner involved! ), Gawker or another publisher can carry on this awesome, profitable and limitless brand. If you’re interested, send a note to jason@inside.com. Also, HackADay is looking for a new editor-in-chief. Please send sample projects, posts and whatever else you got to neweditor@hackaday.com. Thanks for allowing me this and for your help with any new home ideas. 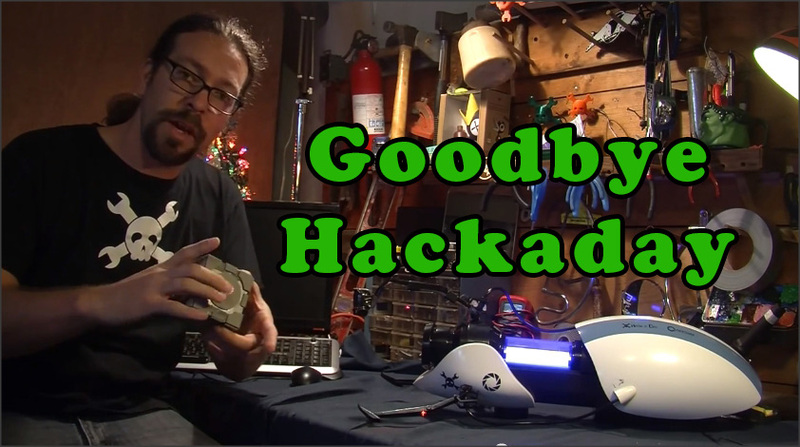 Goodbye Hackaday, I’ll miss you. Farewell Hackaday, the time has come for me to move on. Don’t worry, hackaday will keep going, just like it did when [Eliot] moved on, and [Phil] before him. I wrote my first post on July 9th, 2008. Since then I’ve had so much fun, and written a total of 1,552 posts (including this one). In my opinion, there is simply no other site like Hackaday.com, our readers are passionate and knowledgeable and it shows, even if some of you are incredibly rude to each other(that’s a sign of passion right?). While some projects stand out in my mind, it is the people I have enjoyed the most. The people I met when I went to all the different hackerspaces, my co-writers[Mike Szczys] and[Brian Benchoff], past hackaday employees, our commenters, and even my boss [Jason Calacanis]. If you want to find me, I’ll be at calebkraft.com or on facebook or G+. I have a twitter too, that I guess I’ll start using today. Join me after the break just one more time while a take a trip down memory lane with a few of my favorite moments from the last few years. Oh, and yes, I think saying “after the break” is stupid. What else do you say though? [Chris Young] has a physical disability that means he can’t use a mouse very well. He typically uses Dragon Naturally Speaking for moving his mouse using voice commands but has found that it lacks some features he needs and can crash at times. His solution to this problem was to create a device that will translate IR signals from a simple remote into mouse actions and movements. He is using an Arduino micro for this task, and as you can see in the video it seems to have worked out well for him. He has code and schematics available on his site if you would like to recreate this yourself. 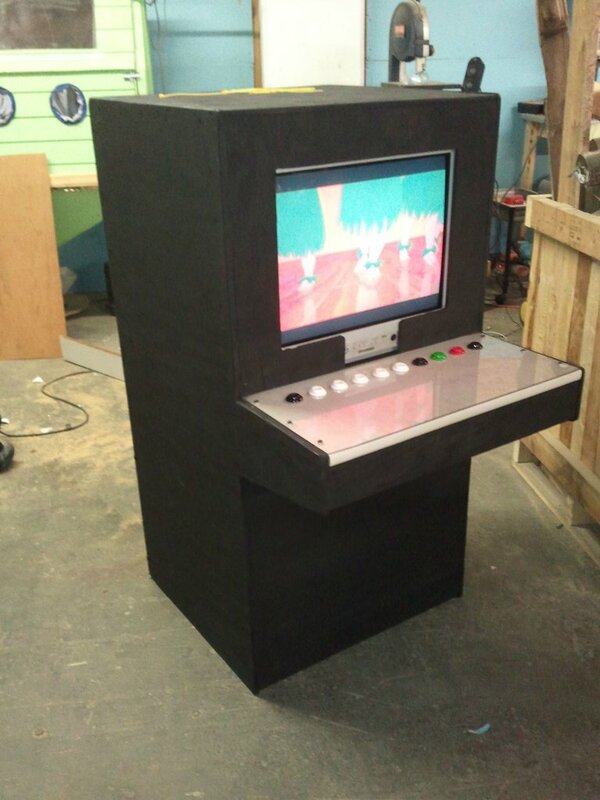 [Chris] has actually built several accessibility devices for himself and others. You should check out his blog for more, including his thoughts on the cost of commercial accessibility equipment vs DIY. If you think you would like to try making a device to help someone with a physical disability access a computer, hop on over to thecontrollerproject.com and join up on the forums. 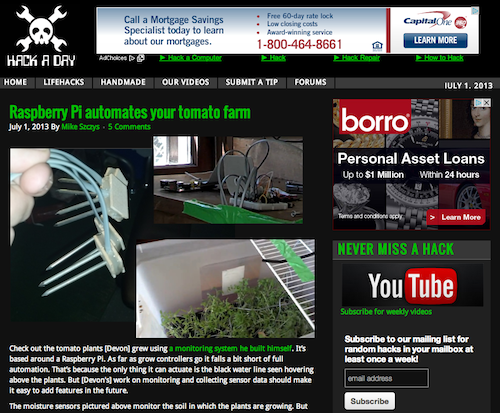 If you haven’t been over to LIFE.hackaday lately, maybe you should check it out. You could be learning how to be a hero with a wine cork, or how to easily break string without scissors(or your teeth). Need new ways to mount your tablet? We’ve got you covered. However, the story that is probably most important right now is how to keep your ice cream from getting that freezer burnt section on the top. Hold on tight. This is going to be a long post. I kept my temper in the video, but here I can just come out and let you know that I’m livid. Every time I start thinking about this, I feel so angry and helpless that my face gets hot and my hands get shaky. I’m getting ahead of myself though, so lets just back up a little bit and talk about a pretty cool kid named [Thomas]. [Thomas] has muscular dystrophy. This means he’s going to gradually lose strength and control in his muscles over time. He has already lost his ability to stand, and even holding buttons on a game-pad for extended times can be difficult. Gaming, as you can imagine, is very important to [Thomas] and people like him. It offers a release of frustration, like it does for all of us, but also a level playing ground. When he’s in the game, he’s like everyone else. I don’t think I’ve ever seen basket weaving done from the point of harvesting the strips from a log. I mean, I knew the bits had to come from somewhere, but usually I see things like leaves or vines. Obviously I just hadn’t really thought about it this way. It is quite interesting.